It's hard to believe we had been in Myanmar for a month already, and then there we were in Chiang Mai in Thailand to renew our visas and get a couple of days of Serious Tourism Activity. Chiang Mai is what Myanmar may be in 20 years' time - still friendly and laid back, but more prosperous and with better-functioning infrastructure. Rubbish in bins rather than the river, roads smoothly paved, drains covered, education not purely involving rote-learning, dogs less mangy and flea-ridden. (Maybe dogs shouldn't be listed as part of the infrastructure, but they kind of are...) At least, hopefully Myanmar's cities will develop like Chiang Mai, rather than like Bangkok - a concrete hideousness in my opinion. Seeing Thailand reinforced what Myanmar has been through in the last 50 years. In 1962, when the military took over, Burma was a leader among Asean countries in terms of economic growth and prosperity. More flourishing than Thailand. Now it's at the bottom of the league, way behind Thailand. Oh, the power of crap leadership. Somehow the Thais have also avoided the separatist violence that has torn Burma apart. 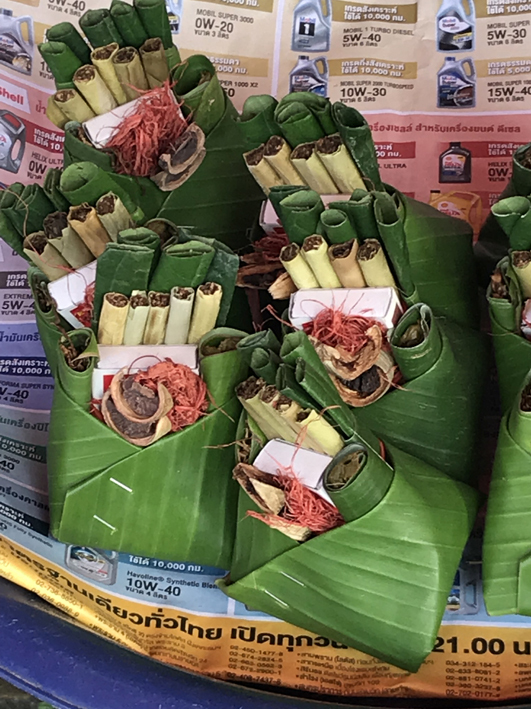 The villages around Chiang Mai are Karen (pronounced Karén), but cursory discussions with a couple of local women suggest there isn't the tribal persecution in Thailand that's taken place against Karen (and other) ethnic people in Myanmar. There is a big group of Myanmar Karen refugees in New Zealand, escaping hideous treatment. It was my first time in Chiang Mai, but Geoff's been here before, in the early 1980s, when it was a small town catering for tourists wanting to go trekking. Now the place is a major city - you'd have to be trucked way miles out of town before you could even think of walking in the countryside. Communal taxis or old-fashioned fire trucks? The old centre of Chiang Mai - inside the moat and the remains of the city walls - is pretty, though fairly polluted (air quality-wise) and very touristy. Every second building is a guest house, hotel, restaurant, cafe or Thai massage parlour (proper massage, though the other is probably there too). In between are bike rental shops, clothing and souvenir stores and tour operators. Outside the centre, every second building is a dental clinic - some pretty flash - catering for the big market in foreigners getting major teeth repairs done cut-price in Thailand and having a holiday at the same time. While not in the dentists' chair, the tourist hoards can visit elephants and Karen villages, go zip-lining, bungy-jumping, pagoda-hopping, trekking, rafting. We chose elephants (more of our unresolved ethical dilemma there in another blog) and zip-lining in some rather glorious jungle. We also hired wobbly bicycles and visited some beautiful pagodas, which are interestingly different from the Burmese ones, despite the relative proximity. Looks like the Thais also have problems with foreigners and disrespect for their religion. Signs like the one below were everywhere, not just around temples, but even at the airport. In Myanmar, a New Zealand bar owner and his local partner were put into jail recently for using an image of Buddha in headphones to advertise cheap beer. 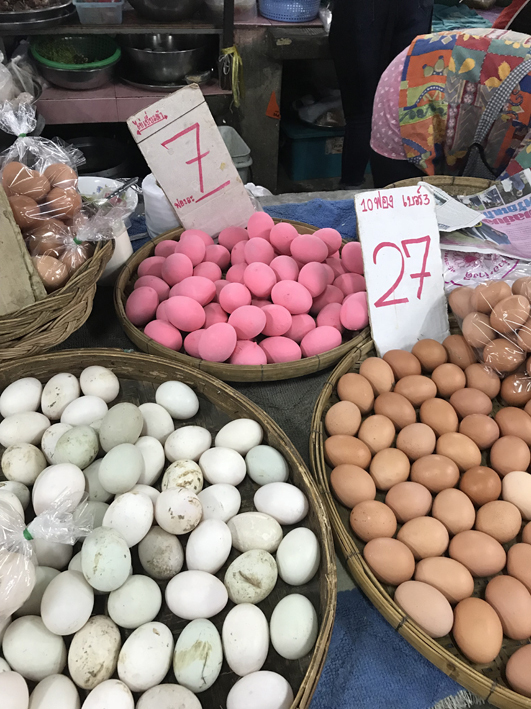 These pink eggs are actually a version of Chinese "100-year-old eggs" - preserved over a number of days/weeks, and then painted pink (can't find out why they choose pink). Inside the white has turned black and jelly-like and the yolk is a sort of greeny colour. I did try them, but think I'll stick to the pink sticky rice. 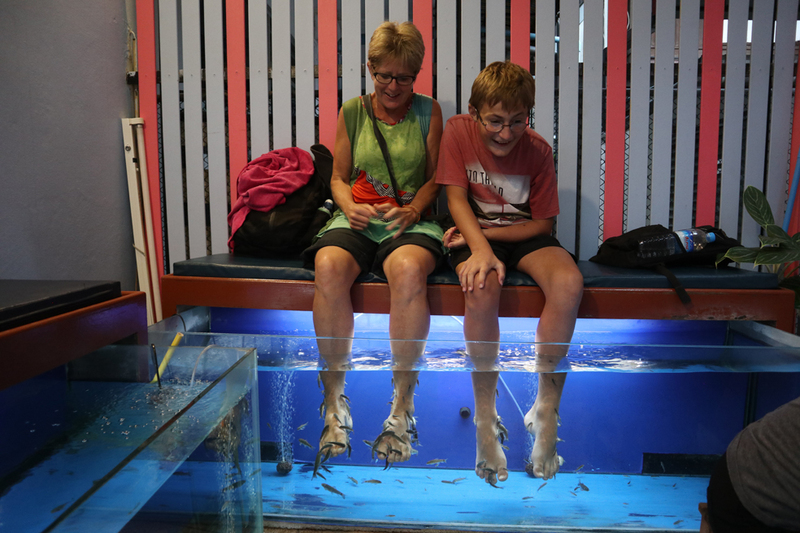 And then at the end we couldn't resist a fish foot massage - a truly weird tickly feeling as little fish cheerfully nibble away at the dead skin on your feet and ankles. For the record, fish particularly like old crusty feet (Geoff's most popular, then mine); they largely ignored Sam's feet and those of a young Chinese tourist who foolishly put her feet into the same pool as Geoff. Our feet felt fabulously soft afterwards though. The ethics of elephant tourism. Q: did we do the right thing going to see the elephants? A: Who knows?